How to take your marketing and promotion to the next level? – an extremely common question and concern. It is all well and good to have a fabulous product or service but if people do not know about it, it is not going to bring you much business. In this modern day and age marketing, advertising and promotions are all around us, constantly being thrown at us from our phones, televisions, buses, signs and screens. On one hand this is a marketers dream with endless possibilities for promotion and having your products and services seen. On the other hand, consumers have become somewhat immune so to really grab the attention of your target audience you need to think outside of the box and do something different. What would be more different and attention grabbing than a giant 3D printed model of your product? Place it in the right location and you are sure to garner attention. We have been working on our large-scale 3D business for a while now, we have printed models for many different applications but the most popular has been for marketing and promotional purposes. One of our more recent projects was to produce 3 x 1.6m Nivea sunscreen bottles. 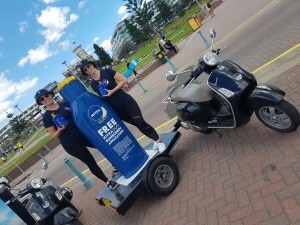 This in itself was exciting but then we found out these 3D printed sunscreen bottles were going to be secured to a mini trailer being pulled by scooters throughout Sydney by Scooter Advertising giant Media-V. 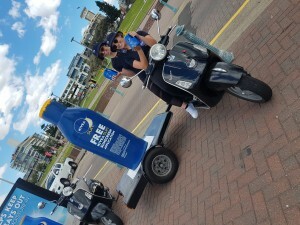 The scooters were then stopping at Manly Beach on a sweltering hot summer day with additional promotional material and staff. The marketing ideology behind this is pure genius, who would need sunscreen more than beach goers, at one of Sydney’s most famous beaches on a hot summers day? The 3D printed bottles also made for a perfect selfie which we all know is what social media thrives on and is a key player in many current marketing strategies. While our 3D printing may not be the cheapest marketing method it absolutely provides a massive return on investment and has proven time and time again to have greater stopping power then regular advertising. We have multiple finishing methods for our 3D prints, some of which provide UV protection and make the model suitable for outdoor use. Our prints are perfect for long time use and can be transported to various location to be used repeatedly, for example at different events and exhibitions. It is time to think big! Want to see some of our other 3D printing projects? Have a look at Beautiful Belle, Jimmy Jackpots and our Rugby Giants. If you want to take your marketing and promotions to the next level talk to us today about 3D printing and how it can improve your reach, stopping power and therefore business.